The 67 Sueños Project was born out of the recognition that the majority of migrant youth were not being included in the national debates about their future. Our goal is to raise underprivileged migrant youth voices to expand the debate and the legislative possibilities. 67 Sueños began as a campaign to expand the Federal Dream Act. The youth wanted to reshape the debate by raising their voices and humanizing the entire immigrant community by refusing to prioritize the status of any particular migrant group. Oyo Bisso -- “This is us” -- represents the challenges that come with the moments of vulnerability within the body. Like blossoming roses, we rise and fade in a cycle of lamentation, resistance, pain, and the battle to move on with harmony in life. Byb Chanel Bibene founded Kiandanda Dance Theater (KDT) in the Fall of 2008 in the city of Brazzaville, the Republic of Congo. Bibene’s choreographic work is inspired by the aesthetics of traditional, pop and folkloric dances from Africa. KDT continues to produce work in the Congo and in the San Francisco Bay Area, where the company is now based. Every year in the Congo, France and the US, Bibene offers workshops on contemporary African Dance. The company has two major programs: Nzela Program, a workshop-research program held in the villages of the Congo to document and learn ancient dances and their translation into contemporary forms; and Mbongui Square, an annual festival of the arts that gathers multidisciplinary artists (dance, music, spoken word, visual art) from the Bay Area and across the world. Kiandanda Dance Theater's work has been supported by The Zellerbach Family Foundation, CA$H Grant/Theater Bay Area, the San Francisco Arts Commission, CHIME Program and the Counterpulse Performing Diaspora Program. Bibene has an MFA degree from Saint Mary's College of California which further empowers his vision of dance and his choreographic research. Cat Brooks is an artist, activist and mother. She received a BA in Las Vegas, NV and studied theater at the Royal National Theater Studio in London. Cat has performed in a myriad of shows including Macbeth, Dangerous Liaisons, Corpus Christi as well as in several short films. Cat is an activist and organizer who most recently founded the Anti Police-Terror Project (APTP) whose focus is on creating a sustainable and replicable model for ending police terror in communities of color across the country. She is also a founding member of the Black Lives Matter – Bay Area Chapter and is one of the Black Friday 14: a group of Black activists who locked down the West Oakland BART station on Black Friday in 2014. Colette Eloi, MFA, is a Haitian Dance Instructor at Laney College, Artistic Director of El Wah Movement Dance Theater, Guest Lecturer, co-choreographer of recent Premiere of Dimensions, "The Town", Co-Creator of Festac Oakland African Diaspora Dance Festival, Seeker of African and African Diaspora Dance Oral Traditions. Aliyah Dunn-Salahuddin is an assistant professor of African-American and US History at City College of San Francisco, and a dancer and performer in the Bay Area. Her most recent work examines the 1966 Uprising in San Francisco's Bayview Hunters Point. Growin’ up in the ‘Hood is a NAKA Dance Theater collaboration with poet and movement artist Tane Madrigal, movement artist Hector Torres, and flautist and beat box artist Terrance McClellan. Directed by José Navarrete. Shakiri, winner of Goldie and Izzie Awards, has been a performer and choreographer in the San Francisco Bay Area for over thirty years. She was a member of Ed Mock’s dance company and learned from him to draw pictures in movement and to pay strict attention to what was happening in the moment! When Ed Mock passed Shakiri understood being 4’7 would make it difficult to find work and as a result started creating her own, discovering her voice, and methods of communicating the stories she desperately wanted to tell. Shakiri has written, directed, and choreographed several dance and theater pieces including, With My Face On Their Face, Breathe, Barnstormin’, and And Their Children’s Children. Her work has a reputation for confronting difficult issues and has been listed twice on the “Best Ten” of the year by the San Francisco Bay Guardian. Shakiri has been a member of the internationally acclaimed Zaccho Dance Theater Company since 1988, has choreographed for Berkeley Repertory Theatre, danced and toured with Dance Brigade, Ellen Sebastian, Hassan Al Falak, and with her own company Shakiri/Rootworkers. Shakiri is also an arts educator has taught kindergarten age children to adults at College and Universities. A visual artist and writer, her latest novel 14 Years Later can be purchased from Amazon. She continues to develop her one woman show, Lottie’s Ghosts, that premiered at Brava! 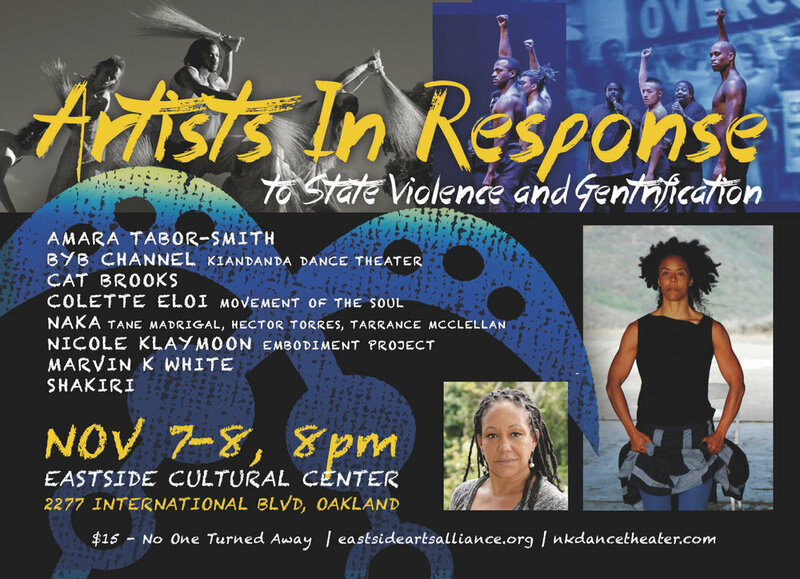 For Women in the Arts, and is currently working in collaboration with NAKA Dance Company on a project called RACE. Yemanya Napue, descendant of the slaves that moved to Nicademus Kansas, one of the only remaining all African American and Native townships west of the Mississippi, founded between 1874 and 1877. Yemanya has performed with multiple musical groups such as SADAKA, ANCESTRAL WISDOM, THE MYSTIC DAUGHTERS, JAZZOLOGICAL MUSEOETRY with Phavia Kujichagulia, and many African Dance companies and musicians throughout California. She is Co-founder of the children’s African dance company BAALAYKOOLAY, A TASTE OF AFRICA and SICK WITH IT at Delta College. She holds over thirty years of experience landscaping and creating community gardens, and local slow food access. Presently, Yemanya has a television show which can be seen on YouTube, called Show Them the World, live streamed through New Life Worship Network.org, COME AS YOU ARE INTERNATIONAL. Amara Tabor-Smith is a dance maker/performer/San Francisco Native and Oakland resident whose work can best be described as Afro Futurist Conjure Art. She is the artistic director of Deep Waters Dance Theater and is the co-artistic director of Headmistress, an international duet collaboration with dancer/choreographer Sherwood Chen. Tabor-Smith has performed in the works of artists such as, Ed Mock, Joanna Haigood, Adia Tamar Whitaker, Ronald K. Brown/Evidence, Aya de Leon, Anna Deveare Smith, Faustin Linyekula, Anne Bluethenthal and Marc Bamuthi Joseph. She is a former dancer and associate artistic director of Urban Bush Women Dance Co. Her work with DWDT and Headmistress has been presented throughout the SF Bay Area, nationally and internationally. Tabor-Smith is an appointed lecturer of dance in the Theater, Dance and Performance Studies department at UC Berkeley and is currently finishing her MFA in Dance at Hollins University and the University of Music and Performing Arts in Frankfurt, Germany. We are living in the age of Marvin K. White. Such pronouncements sound lofty when issued by anyone, particularly when he and I are running buddies dashing down our singular and collective paths to publication. But trust me, when you read this man’s work you’ll close your eyes and nod appreciatively to the gospel. He didn’t blink. Marvin’s works are significant contributions to American letters. His poetic insights are necessary places to lay your hat and rest your feet. For those seeking literature that pushes, pouts, praises and plays with language in soothing ways, you’ll find a very generous poet in Marvin. His seductive verse gently reminds us of our duty to be gracious, kind and vulnerable with each other. Born in Oakland, California to Curley Joseph and Margaret White, Marvin was raised by a faithful mother and grandmother named Bessie. The baby of the family grew to be a skinny, delightful teenager whose eyes caught a lot of stories. Early on Marvin began to chronicle his life with words and not too few cakes. But I am getting ahead of myself. Supported in part by the Zellerbach Family Foundation and the William & Flora Hewlett Foundation.